It is seven o’clock in the evening. You are holed up in an obscure corner of the library as you plug away at an English paper due in two days. You have come to the point where your frontal cortex can no longer construct a coherent sentence, let alone piece together a detailed analysis of Dostoevsky. Looking at your friend, you recognize the same glassy-eyed look in his face. “What are you feeling?” asks your friend. First things first: are you hungry? Yes? Then check out some of the nearby eateries. 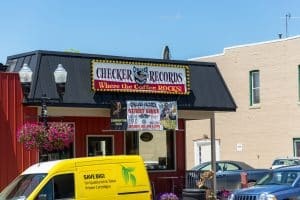 If you want quality coffee and pastries in a cozy, musical environment, mosey on down to Checker Records for a break from the grind. Try a handmade sandwich, cold brew coffee, soup in a bread bowl, or any other number of fresh goodies at Hillsdale’s newest sandwich shop. If it’s a nice day for ice cream, grab a buddy and choose from the bevy of flavors available at Coneys and Swirls downtown. Are you awake at an ungodly hour looking for cheap but good food to drown your studying sorrows? The Palace Cafe is open twenty-four hours on the weekends and provides copious amounts of breakfast food at low prices. Still awake at an ungodly hour, but this time with an insatiable sweet tooth? You had better find a few good friends with a reliable car and make the thirty-minute drive over to Coldwater. Open twenty-four/seven, Dutch Uncle Donuts is every broke college student’s ideal for cheap yet satisfying confections. Do you need to get some energy out? Try some of Hillsdale’s many sporting activities. If you like a good game of beach volleyball, grab your Bluetooth speaker and a gang of friends and head over to the sand volleyball courts at Hayden for some sandy recreation. Need more indoor competition in your life? 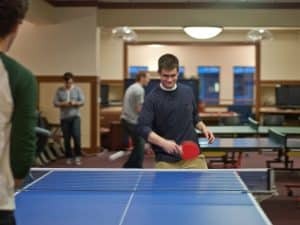 You can test your ping-pong and pool skills out in the student union. Perfect for a study break. Enjoy organized sports without the commitment of club or varsity athletics. Join one of the numerous, seasonal intramural sports put on by Campus Rec. On pretty much any sunny afternoon circa four o’clock, you’ll find a gaggle of friendly Frisbee players on the quad. Lucky you, they’re probably looking for additional participants to start a pickup game. Want to experience as much nature as possible while getting out that energy? Borrow paddles from the union and drive down to Baw Beese Lake for some time on the water. There is easy access to kayaks and boards on the dock. If you’re feeling adventurous, hike out to Hayden Park to pick up one of the mountain bikes in the shed and explore the trails that wind through the woods. Do you have exactly 1,776 minutes of freedom? Exercise your Second Amendment rights out at the Hillsdale shooting range. From fishing to swimming to picnicking, Baw Beese Lake affords an opportunity to get away from campus and enjoy the outdoors. Do not miss the chance to go out to Hayden Park or Baw Beese with a handful of friends and count shooting stars on one of many crystal-clear Michigan nights. In the mood for a classic pastime? The City of Hillsdale offers some fun recreation centers such as a roller-skating rink, a movie theatre, and a bowling ally. Find a family of friends to cook with, or for, in one of the many kitchens around campus. You will find kitchens in the dorms, in off-campus houses, and Greek houses. 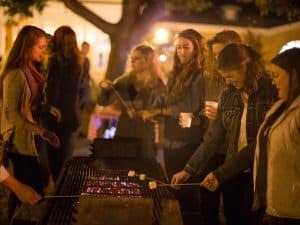 Light up a fire in one of the fire pits behind student housing and invite your friends to come warm up. S’mores optional. If you’ve wondered what it might be like to lob foam balls across campus while brushing the bronze shoulders of some of the greatest thinkers in American history, by all means, take up statue golfing. This is a uniquely Hillsdalian activity that involves golfing around campus using the statues as holes. Attend one of the numerous events put on by the Student Activities Board. These include, but are not limited to: Garden Party, bubble soccer, and the color run. Is it Thursday evening? If yes, head down to the lobby of Olds Dormitory and burst your sides laughing at some of the most quick-witted students on campus. If you feel pent up by the arctic Michigan weather, defy the elements! Brave the cold! Participate in some winter activities! Even if you are not a wonder on ice, that doesn’t mean you can’t check out a pair of skates at the union and have some fun on Baw Beese Lake with some good friends. Let the snow bring out your inner child. Dig up some sleds, find one of the hills on campus, and go sledding with your squad. Is it after midnight? Join some of the craziest individuals on campus in a rugby game on the quad that happens only after a heavy snowfall. Need a short break to get the blood flowing? Challenge your study buddies to an old-fashioned snowball fight outside the library. You can grab skis and poles from the shed at Hayden Park and explore the trails by ski. Who doesn’t need a little exercise while enjoying the winter wonderland? 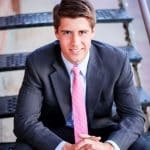 Josh Bailey, ’19, is a marketing major from the back roads of Iowa. A volunteer program leader, intramural athlete, and dedicated student, he can usually be found either busy with a project, sweating in the gym or buried in a book in the corner of the library. In his free time he enjoys adventurous shenanigans with the guys in his dorm.